Do you remember the first time that you realized the true power of inbound marketing? I do. I was running a small marketing consulting company and was able to land a speaking gig in front of a large number of local non-profits. Through the talk, I collected more than 50 email addresses from the attendees. For months, I published new (and helpful) content on my blog, and emailed it to those subscribers. One day I got an out-of-the-blue email from one of those 50 non-profits. They wanted to talk about a consulting package. Within a week, I had closed the largest consulting deal that I had ever landed. Needless to say, I was thrilled. Although, it left me wondering – why did a deal of that size come through so quickly, when a project half the size can sometimes take months? The answer is simple. My continuous drip of helpful content had slowly built trust with their team. When it came time for them to make a purchase there was very little left for me to do. All I needed to provide was a place for them to sign. That’s inbound marketing at its finest, but, it may not be how you are approaching it. Too often, we forget to take into account the trust factor, and get obsessed to prove ROI. But, your blog doesn’t exist to convert customers (at least not yet) it’s there to build trust. That’s a big difference, and it’s an important one. Promote that content and watch readers share. Sit back and watch as visitors experience your amazing content and immediately buy something from you on the spot. Unfortunately, this is not how it works. It can’t be. It’s not how you build trust, and that’s what inbound marketing is really all about. We all want and need customers, but all to often we try to make the leap between visitor and customer far too soon. 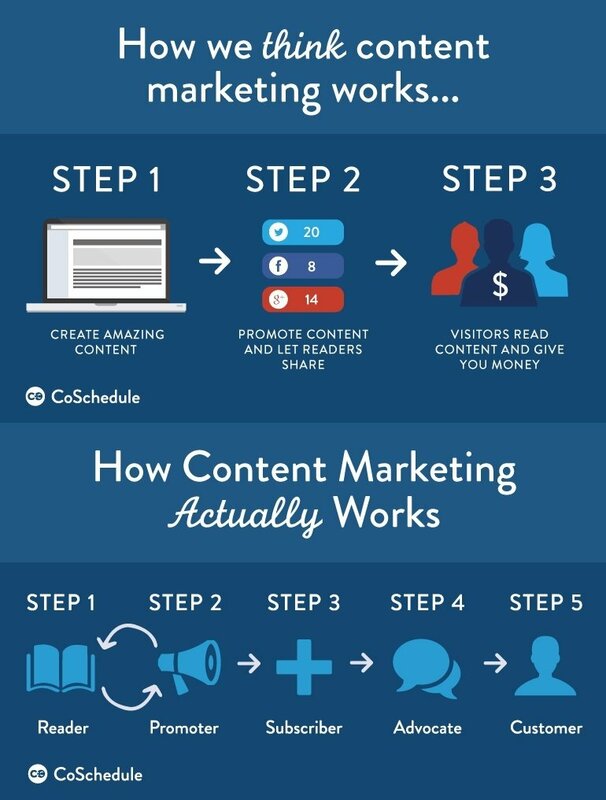 Rand Fishkin of Moz.com calls this the “greatest misconception in content marketing,” and he’s right. Rather than seeing your visitors as prospects waiting to be sold, start thinking of them as advocates in the making. Here’s a better way to look at your inbound marketing funnel. Before anything else, your visitors need to become readers. This basically means that they came to your site and found something useful. At this point, they probably aren’t very familiar with you or your brand, so you are really at the beginning. There’s no real opportunity for a sale yet. Over time, you’ll turn readers into promoters. This can happen via an email forward or a social media share, but either way, it means that your reader has begun sharing your content with their network. It is the first stage of trust. Expect visitors to cycle between the reader and the promoter phase for awhile. You’re building their trust. The third phase is the role of a subscriber. Here, a casual reader will become a devout consumer of your content by joining your email marketing list or RSS feed. No matter how they subscribe, this person has moved to the point where they clearly recognize your name/brand, and have started to assign you trust. As your subscriber receives your content over and over, they should slowly transition from a casual reader into an outright advocate – frequently recommending your content via social media, and regularly participating in your comments section as new content is published. These are loyal readers that seem to drop everything when new content arrives. After months of blogging, tons of emails, and probably a comment or two on your blog, your advocate may be ready to become a customer. Finally! Just like my non-profit, the beauty of this stage is that they have so much trust in your brand that the buying process is a cinch. I know what your thinking. This sounds slow, but that’s beside the point. Jay recently shared a story about a doctor who called new patients over the weekend to see if they had any questions about their upcoming appointment. I bet that process is slow as well. Sometimes, slow works. Build for the long haul. Build trust, and nurture your conversions. Now it’s your turn. How have you see trust impact your inbound marketing?